How to write a clear and simple B2B marketing strategy for an SME. When you want to create a marketing strategy, where the heck do you start? I mean, really. What is it? There are so many complicated definitions for marketing strategy. They tell you all about products, goals, focus, customers, services, markets, positioning and profit potentials – and could have you cradling your head in your hands in despair in the first sentence. The trouble is, they’re all correct. They can just be a bit hard to decode into something you can do. That’s what this post is for – to help you actually crack on with writing your own strategy. 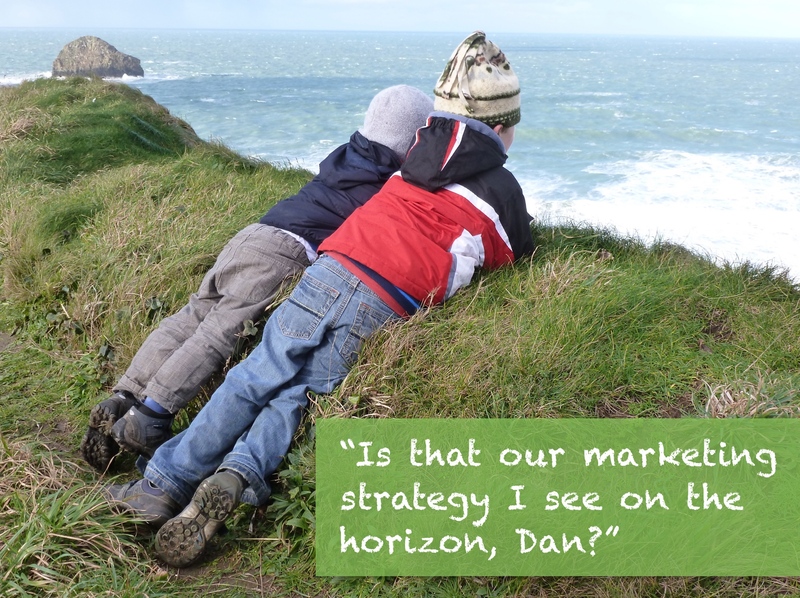 So first, here’s my most basic, plain English definition of what a marketing strategy is. Working out which new customers you will do a really good job for. A better job than someone else will. And whilst we’re on the topic, there can be some serious confusion about the difference between your marketing strategy and your marketing plan. How you will find those new customers who will be very pleased to have done business with you. Because you did a really good job for them. Better than anyone else would have. It’s worth adding here that I think there is a strong connection between the length and happiness of your customer relationships and the appropriateness (is there a shorter word for that?) of your marketing strategy. As a slight aside, and while we’re on the plain English thing…. Marketing explained in three steps. Find out what your perfect customers want and need with a spot of customer research. Set yourself up to be as good as possible at that. Find and tell those customers that’s what you do. Note – These are all purely my own views. Lots of other knowledgeable folk – and well-reviewed books; and clever professors; and venerable marketing gurus; and fine, upstanding individuals – have very different ways of explaining it, and that’s all jolly fine by me. Breaking a marketing strategy up into manageable chunks makes it an awful lot easier to tackle and create. Here I’ll explain each chunk I think you need, and a few useful ideas on how to structure them. I’ve matched them with their marketing jargon so you can cross reference them against any other reading or resources you are using to get your head around this. Only six things, I hear you ask? Work out who those firms are. Identify them. Look to your existing customers for inspiration. The happiest and most profitable ones, with whom you have the longest relationship. Those are the ones you want more of because these are the ones you clearly do the best job for. (Either that or they’ve turned to stone, are too disorganised to leave and too scared to complain). Commonly known as target audience or ideal customers. Given this post is for the SMEs out there, now identify a more specific and narrowly defined group of people or firms you can do a really, really (really) good job for. These are a target audience segment. You could have more than one of these, but don’t go bonkers. This is actually the value you bring to your customers. Also known as your value proposition. Can be easier to think of it slightly obliquely as the problems you’re really good at solving for your customers. This can be very hard to define, so here’s an example. Software company selling accounts payable automation software. A good client for them is dealing with 10,000 invoices per year, partly manual, partly on a SAGE type finance system. They do most of their stuff on paper, pay duplicate invoices by mistake, payments are slow to be authorised so suppliers don’t give good rates and invoices can’t be found or checked easily. If you automate your accounts payable processes, it works much better. Invoices are paid accurately and on time. Mistakes are rare. Suppliers give fast payment discounts. The accounts payable team are happy bunnies. So the value this product brings is financial (suppliers charge less, lower headcount reflecting reduced workload), cultural (happier suppliers, happier finance team) and business related (accurate, real-time financial information). Ideally you are the one who does the best possible job. This is your USP – your Unique Selling Point. Otherwise known as differentiation – why you are different from other suppliers (in a good way). If in doubt, ask your customers. If they and you can’t articulate it, you probably aren’t different enough. Work on that. It will be worth it. In the example above, the software company is a small, independent, family-run firm with a very admirable company culture and set of values/ethics. These values run through every dealing it has with its own employees and also – critically – with its customers. So it only takes on customers it knows it can do a really (really) good job for. And then it looks after them as if they were royalty. Lovely. It specialises in accounts payable software because it can spend time, money and energy in getting that completely right, rather than chasing new markets willy-nilly purely because there are ‘huge opportunities for growth’. They’ve become an absolute master of their trade – from both a product and a knowledge perspective. They also have a culture that is reflected in their superb customer service at each and every contact point with a customer. It is the combination of these two things that differentiates them from other suppliers. Your mission. Connected to: vision, values, culture, ethics. This is probably the most difficult to pin down. If you haven’t got a mission, think a bit about why not. Some underlying passion or love for what you do – or the way you do it – is usually needed. Tip: many businesses don’t have a real mission, and really struggle with this part of their strategy. By itself – not having a mission is not necessarily a problem. Many businesses are happy. They provides goods and services, look after their customers and salaries and bills get paid. But without a real mission, most firms will remain average and fail to grow if and when they want to. Or they’ll fade slowly into obscurity instead of selling themselves for a tidy sum after 20 years building a great business. Some (rare) people just have a inbuilt mission to do something specific with their passion, which turns into a business. For the rest of us more normal folk – it can be easier to think of it as a mission around the way you do business. This does put the emphasis slightly more on your values than on your mission. I’m learning that looking more closely at your values you hold can lead you towards uncovering an unexpected mission. Have a think about it and see where you get to. (Call 07827 297569 if you get stuck). Pretty icky name for it, messaging. Now, this isn’t about the copywriting thing. Or your strapline, tagline, slogan or whatever. Or the specific headlines on your website. It’s better imagined as the main things you need people to really understand, think and believe about you. And then tell others about. Not the itty bitty details of your services. And not necessarily just the benefits. And – critically – not what you think about yourself. For an interesting exercise to help you arrive at the right messaging for you – have a read of my LinkedIn post on the topic. It’s how you sound to others. It’s how you get the personality of your business across to others. Business works best when you do business with people you have something in common with. So let them get to know you – the real you. Be brave and be yourself. It will be worth it. If you’re worried about coming across as the type of business you really are, you may have more deeper seated problems than a good marketing strategy can fix. Grab a business coach instead. If you’ve found this post useful, interesting, actionable – or all three – please share it with your community or contacts so they can have a read of it. And finally (at last). If you think you need help from a sales and marketing consultant working this out alongside you, and you’re based in Hampshire or a nearby county, then why not think about hiring me?